Am I Missing Something About Wall Street? With huge swings in recent months and years of the major indices of various stock markets here and abroad, you would think that its participants are on one of the many anti-psychotic drugs that just aren’t working. At least they appear to have be off the anti-depressants and are taking off their rose colored glasses. I actually heard somebody on CNBC mention wealth preservation. These participants manage huge sums of money, as the average investors no longer believes they can compete in these highly contested and manipulated markets. With both computer trading and data manipulation going on, the average Joe just don’t have the resources to trade against the professionals. These pros however do have the resources and this makes it both a chess match and a role of the dice trying to gain some profit for their clients competing against the other pros. Professional managers, market makers and day traders play the markets with every bit of knowledge they can by hook or crook as we know to compete against one another while trying to game the system. Stock market investing is not a game of the faint hearted nor the investor who wants to hold stocks over the long term. 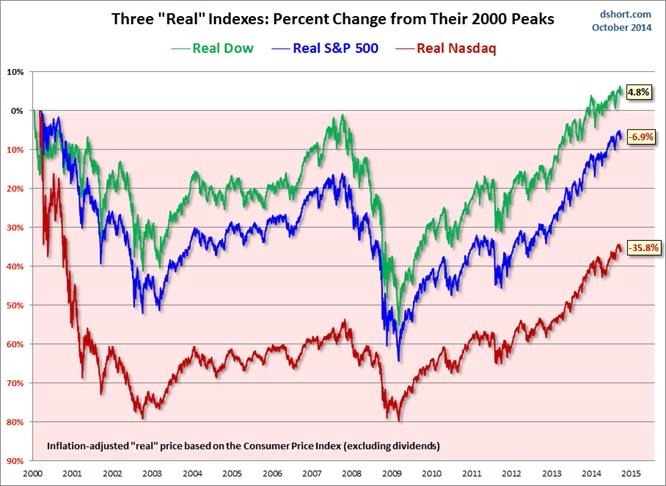 Since 2000, The Dow, S&P and NASDAQ have had almost no “real” gains after adjustments for inflation and trading costs with tremendous amounts of volatility. The US Government and Central bankers have literally pumped in $trillions into the economy. Those who understand economics however, know that government monetary stimuli is the least advantageous methods to spur economic growth, but that is all they have left in their arsenal, except for doing the unthinkable, reducing taxation, regulation and the size of government to reduce government spending, which is the most favorable method to spur long term economic growth. 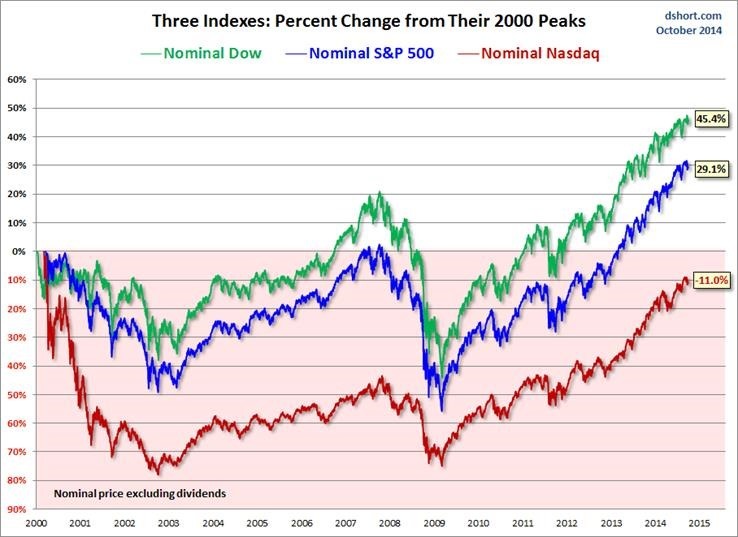 From this chart, it is almost a fifteen year period and it does not bode well for the equity markets. This does not include dividends or reinvestment. Not all stocks pay dividends and many people take out profits as income. So now let’s look at gold over the same period. 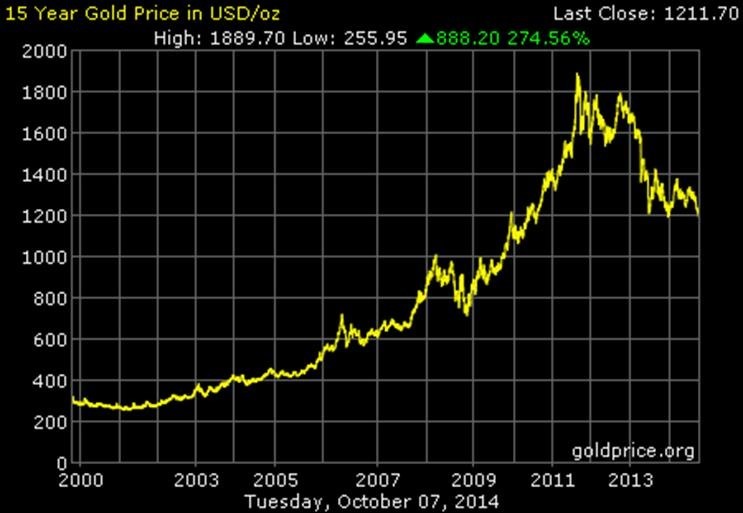 Gold was around $300 an ounce in 2000 and it’s about $1,212 today. Pretty straight forward. Over a fifteen year period that’s basically a 400% gain vs equities which are at or near nothing when adjusted for inflation. Food prices are higher as are medical costs, etc. So your gold would be worth more today but you have much less purchasing power; equivalent with what you would have gained if you had equities. The cost of holding gold and taking personal possession is really cheap as compared to buying and selling stocks and paying management fees, etc. Gold has done its job and at virtually no risk. Were as with equities, for each person who made money, somebody lost. A rather tremendous risk. I don’t understand why somebody would be willing to take these risks and absorb the costs associated with participating in the various stock markets except for those making their living from it. For the individual that just want to build wealth, this is not the market that I would participate in because of both risk and volatility. There are a bunch of ways to make money but all have associated risks. To me, preservation of wealth should be first and foremost on ones agenda in this highly volatile economic period. If you want to take a percentage of your wealth and take the risk, have at it, but don’t expect it to achieve great results after you factor in inflation. Fifteen years of history has provided those facts. If you take the last fifteen years and apply the results to the next fifteen year, anyone with any level of cognizance should know what will happen to the US$, equity markets and gold. What could change it? Only public policy and that has zero chance in hell of happening in this author’s opinion. Instead of doing what could work, the political system has continued along the same path of what hasn’t worked and gotten us to these results in the first place. Sadly this is what has happened throughout thousands of years of history. We just don’t appear to learn from history. So what’s has been happening lately? They have increased government spending, taxation and regulations, if you consolidate the local, state and federal levels so the economic environment has gotten worse and should continue to get worse. Consider letting the government spend the money to build a bridge, or letting the private sector spend the money to build a cement plant. What is going to provide the greatest long term benefits? Obviously the cement plant. But then you need to understand that taxation and regulations are making it near impossible to build a cement plant today that will be profitable over the long term. Your society ends up with stagflation because government spends the money it does not have and must borrow it for the bridge project. The construction company who would receive the Government contract, takes home the only real bacon that must of course be adjusted for inflation and the taxpayer will have to pay for those costs sometime in the future through higher taxation. Conclusion: take these numbers from the two charts and multiple them by 5 to 10; about the same level of the total of local, state and federal government spending and the ensuing deficit increases that have occurred over the last 5 to 10 years, because that’s what it takes for various polices to have an effect on the overall economy. Gold could easily be above $5,000 and the stock market could easily be up 500% or more. We’re looking at the stock indices adjusted for inflation. Here they are unadjusted. Not very impressive over a 15 year period.